Compliance monitoring and asset management for all property types, taking the burden off of your staff, mitigating risk and keeping your properties in line with changing regulations. Changing Affordable Housing regulations can throw you a curve. Penalties for noncompliance can mean huge financial losses for owners and fee managers. That’s a lot to keep up with. Stay ahead of it all with RealPage Compliance Services. Our dedicated teams of compliance experts are at your service to help mitigate risk, maximize occupancy and ensure property compliance with federal, state and local government regulations. Knowing whether a property is in compliance with these regulations often requires expertise that few property managers have, in spite of the fact that millions of dollars are at stake. RealPage Compliance Services provides services to ensure compliance with local, state and federal Affordable Housing regulations. Our products and services work seamlessly within your company’s business processes to meet all of your asset management and compliance needs. It’s the expertise you need to be sure. Using our years of expertise in the various federal, state and local Affordable Housing programs, we review your move-in certifications and annual recertifications to ensure compliance on an ongoing basis. RealPage will certify that your units are in compliance. We provide an unbiased assessment of applications and a thorough review of move ins, annual recertifications and all supporting documentation. If we determine you are not in compliance, we can provide the advice and tools you need to get you back on track—and stay on track. In-depth ADA/504/Fair Housing Accessibility Plans, which include inspection of facilities and a subsequent comprehensive, customized report showing owners how the Americans with Disabilities Act (ADA), Section 504 and the Fair Housing Amendments Act apply to their specific property. Capital Needs Assessments provide owners extensive insight into the useful life of a property’s building systems so that they can plan for a property’s capital expenditures over the course of the next 10 to 20 years. Asset Management Inspections provide cost effective expertise that helps syndicators, owners and Managers prepare for MORs, REAC and state agency inspections. Compliance is never easy, but when your company is growing into new markets, it takes more than a full-time staff to manage existing compliance measures, while researching and learning new markets and new state and local regulations. In fact, it can be a huge burden on your property management company’s finances. That’s what Fairway Management found as they entered more and more states. Noncompliance with the ADA, Fair Housing accessibility laws, and many others all carry stiff financial penalties, civil fines and more—there is no room for assumptions. Whether you own or operate conventional multifamily, commercial, military housing, affordable housing, student or senior housing, this in-depth presentation takes you through the complex landscape of regulations only an expert would be able to keep up with. Watch this on-demand webcast to learn more. Reduce risk, maximize occupancy and help ensure your properties are in total compliance with all federal, state and local government housing regulations with RealPage Compliance Services services. Watch this overview video to learn more about RealPage Compliance Services. 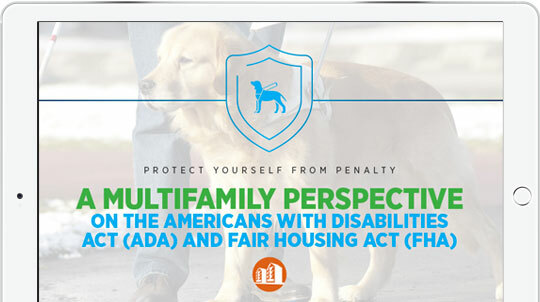 Download a free, in-depth eBook that helps to clarify the law and provides a checklist of questions every owner and operator should ask to mitigate ADA and FHA noncompliance risk. RealPage Compliance Services provides asset management and compliance monitoring for all types of properties, including affordable, conventional, student, senior and military. We work with you to create a plan so your properties meet and maintain accessibility and compliance standards through monitoring, audits and property inspections and reports. Our staff has extensive experience in compliance monitoring of Low Income Housing Tax Credit (Section 42), tax exempt bond, Section 8, HOME, and Rural Development properties. Our staff brings expert, real-world experience to our clients. Greg is responsible for business development, long-term strategy, client relations and erudition on the vast complexities of the affordable housing industry. Greg has a Bachelor of Science degree in management from Appalachian State University, is a Certified Professional of Occupancy (CPO), and a National Assisted Housing Professional-Executive (NAHP-e). He is also a Specialist in Housing Credit Management (SHCM), a Housing Credit Certified Professional (HCCP) and a Certified Credit Compliance Professional (C3P). He is a past president of the Southeastern Affordable Housing Management Association (SAHMA) and is currently on its Leadership Council. He has served on the Executive Council of the National Affordable Housing Management Association (NAHMA) and is on the SHCM Technical Advisory Group. He is also a national trainer on tax credits, fair housing, and accessibility. Trina oversees the day-to-day operations of each of RealPage Compliance Services’ teams. She has been in the affordable housing business for over 30 years and has worked with the Low Income Housing Tax Credit program since its inception. She has an undergraduate degree in Business Administration from the University of South Carolina. She also has numerous affordable housing certifications, including the Specialist in Housing Credit Management (SHCM) and the Housing Credit Compliance Professional (HCCP) certifications. Clark Crowther has been involved in various facets of the affordable housing industry since 1983. He oversees the Asset Management team and is responsible for several asset management contracts with national tax credit syndicators and owners. In addition to asset management, his team performs on-site Accessibility Reviews and Comprehensive Needs Assessments. Clark has a degree in marketing from Appalachian State University. He also holds the SHCM, CPO and FHC certifications through the National Affordable Housing Management Association. Celeste oversees the team of Compliance Partners and coordinates training and development of instructional materials for our team and our clients. Celeste has been involved in multifamily housing since 1997 and in affordable housing since 2000. She currently holds the Specialist in Housing Credit Management (SHCM), the Certified Occupancy Specialist‐Public Housing (COSP) and the Housing Credit Compliance Professional (HCCP) designations. 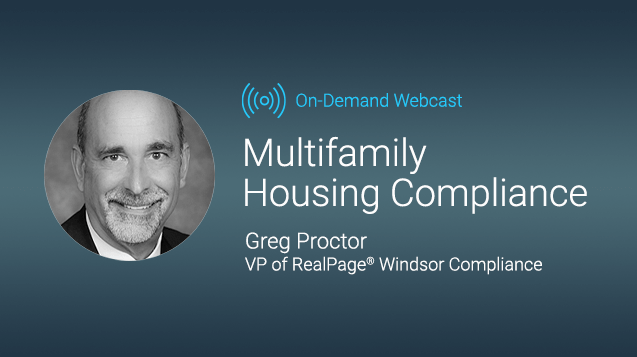 Ready to Simplify Multifamily Housing Compliance? Imagine having the services and expertise on your team that can simply multifamily housing compliance. Getting it is as simple as getting in touch with RealPage Windsor Compliance. Ready to get started? Contact a Windsor Expert at 800-336-8109.